Donald Trump has won the US Presidential election 2016. Most of the world is reacting in shock and disbelief. People are panicked over the uncertainty that President Trump would bring in the coming days. Amid all this, a Pakistani TV channel has scaled new heights of craziness. We all know that Pakistani media runs things which leave us completely puzzled; whether they are awkward politics-related stories with Bollywood songs playing in the background or absurd content which just does not qualify as news. 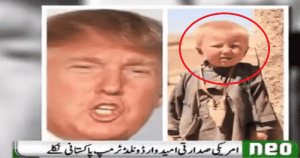 And this time, a prime time report that aired on Neo News reported that Donald Trump was originally born in Pakistan. They also reported that his name is Dawood Ibrahim and not Donald Trump. All of this was based on some satiric comments by a few people on social media. According to their report, he was adopted by the Trump family and was taken abroad after that. While we understand that this report was based on people contributing to a ridiculous joke, we think such nonsense shouldn’t make it to national TV. Social media is a jungle basically and you shouldn’t run things and only take Facebook or Twitter as a source because then absurd stuff like this makes it to national television.